A SOUTH AFRICAN man who used a racial slur in a holiday video he posted online faced a backlash from across the political spectrum on Wednesday. 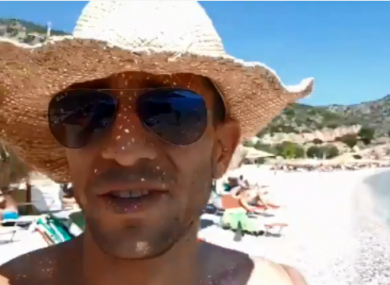 The man, identified on social media as Adam Catzavelos, filmed himself wearing a straw hat and mirrored sunglasses on a pristine beach in an undisclosed seaside location. “Amazing sea and not one k****r in sight”, he said to the camera, using an insulting term for a black African. A government minister called for the video to be reported to police. “The racist video which shows a man allegedly identified as Adam Catzavelos using the ‘K-word’ is absolutely unacceptable,” tweeted Culture Minister Nathi Mthethwa. The Eyewitness News site reported that the opposition Economic Freedom Fighters party was preparing to report Catzavelos to police. Sports brand Nike reportedly closed some of its stores in South Africa as a precaution after it was claimed on social media that Catzavelos’ wife worked as a brand director at the retailer. The main opposition Democratic Alliance party said in a statement that “those who espouse his views have no place in a united South Africa”. “The likes of Catzavelos undermine the project of nation-building and reconciliation,” added Luyolo Mphithi, the party’s youth leader. Local media reported that Catzavelos had been fired from his job at Johannesburg-based St George Fine Foods following the racism firestorm. Nedbank, one of South Africa’s largest banks, distanced itself from Catzavelos after it emerged that he had participated in a business development programmes sponsored by the bank in 2014. “Nedbank… strongly condemn all forms of racism,” said the bank in a statement. In 2016, South African estate agent Penny Sparrow likened black beach-goers to monkeys in a social media outburst and was fined 150,000 rand (€9,050). South Africa remains deeply divided along racial lines 24 years after Nelson Mandela came to power vowing national reconciliation following the end of white-minority apartheid rule. Email “Nike closes South African stores over reported link to man who used racial slur in holiday video”. Feedback on “Nike closes South African stores over reported link to man who used racial slur in holiday video”.